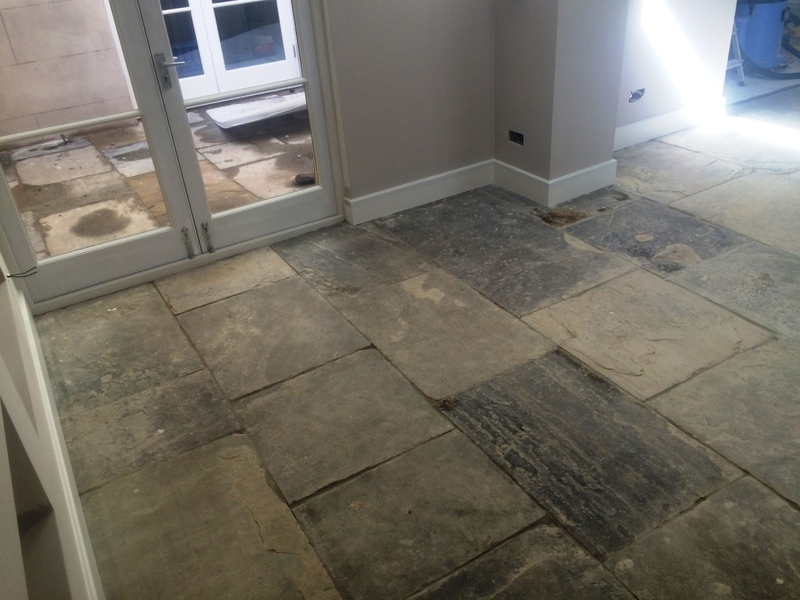 This Yorkstone tiled kitchen floor at a house in Brightonhad been hidden under 18 months worth of accumulated builders work, intended to get the property ready for new occupancy. As you might expect, the tiles were extremely dirty, caked in layers of dust and muck left over from months of brickwork. 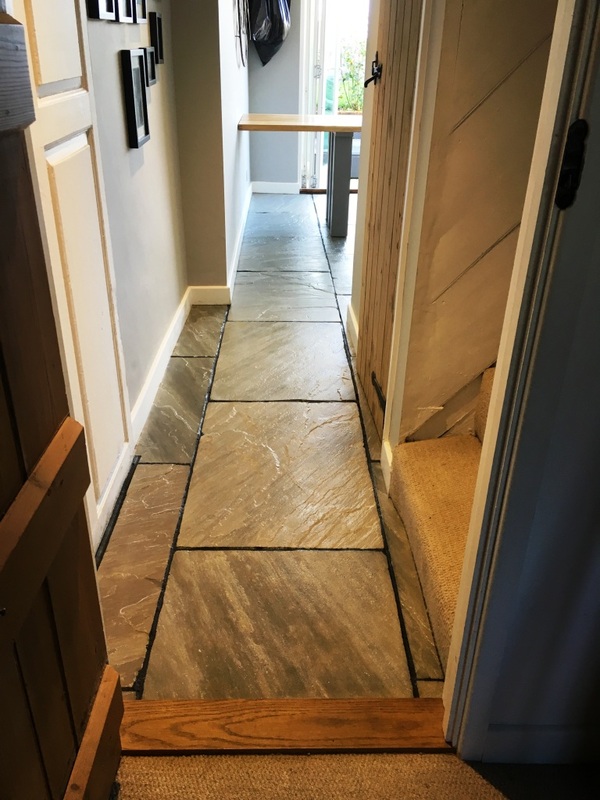 The site manager asked me to come down to the house on the South Coast to clean and seal the Yorkstone tiles before the new homeowner moved in. 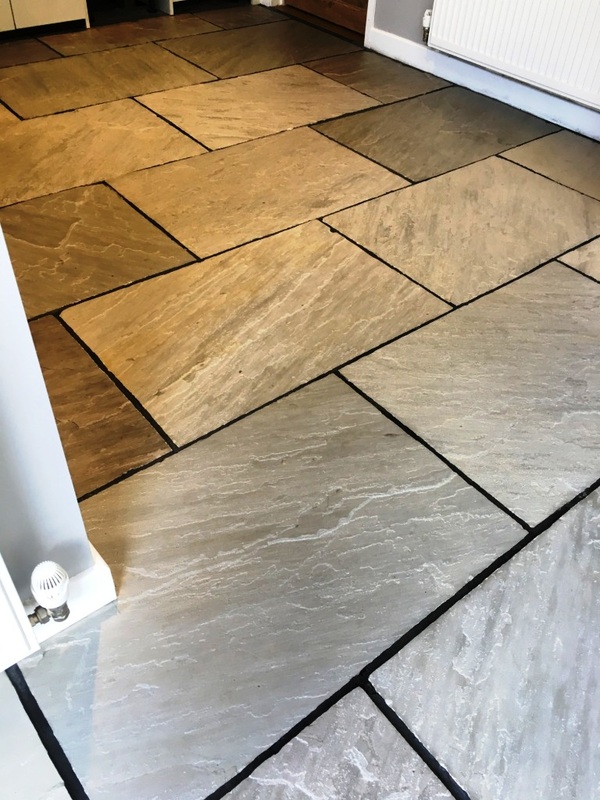 It should be noted that Yorkstone is a tightly grained variation of Sandstone, named as such due to being worked in Yorkshire quarries since medieval times. 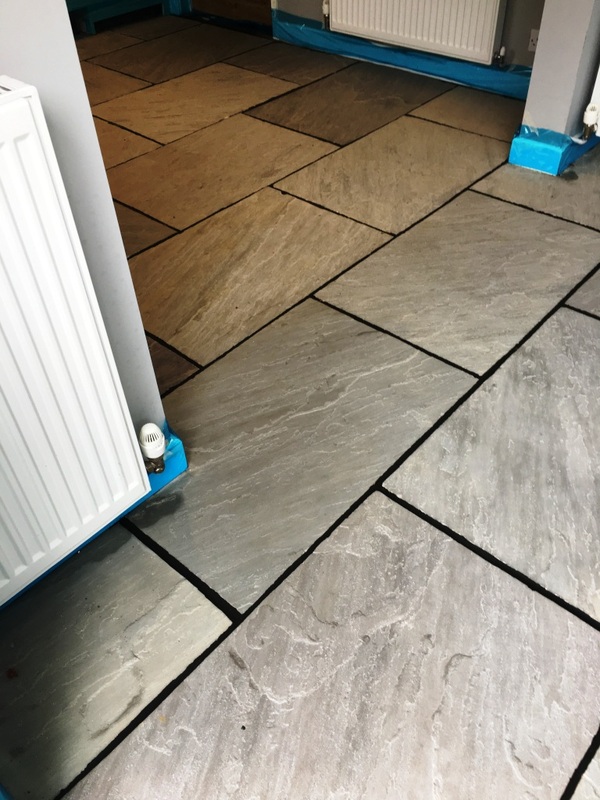 Thanks to its hard wearing nature and being reasonably inexpensive, it is still popularly used for interior and exterior furnishing, construction and landscaping across the globe. To clear the floor ready to be cleaned, I firstly vacuumed up the excess layers of dust and muck using my strong wet/dry vacuum. Then, I applied a solution of Tile Doctor Remove and Go stripper, mixed with a dash of Tile Doctor Grout Clean Up. 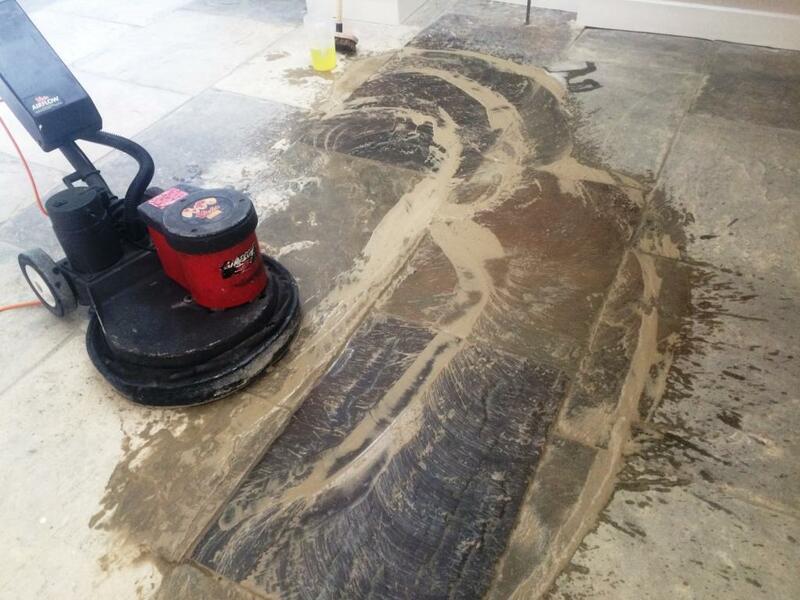 This would break down any old sealer and remove the stubbornest muck, while also cleansing the grout at the same time. Next, I attached a coarse 200 grit pad to my buffing machine and set to work eradicating the subsequent layers of muck. Almost immediately a brown sludge developed, which I promptly removed with the wet/dry vacuum. Stopping first to rinse the floor with clean water, I proceeded with the buffering process, this time with my bristly patio cleaner attachment, which was coarser still to ensure the difficult dirt was completely broken down. Finally, I rinsed the floor again with more clean water to remove any excess cleaning slurry, and then left it to dry. Three days later, once all moisture had evaporated, I returned to the property to seal the floor. 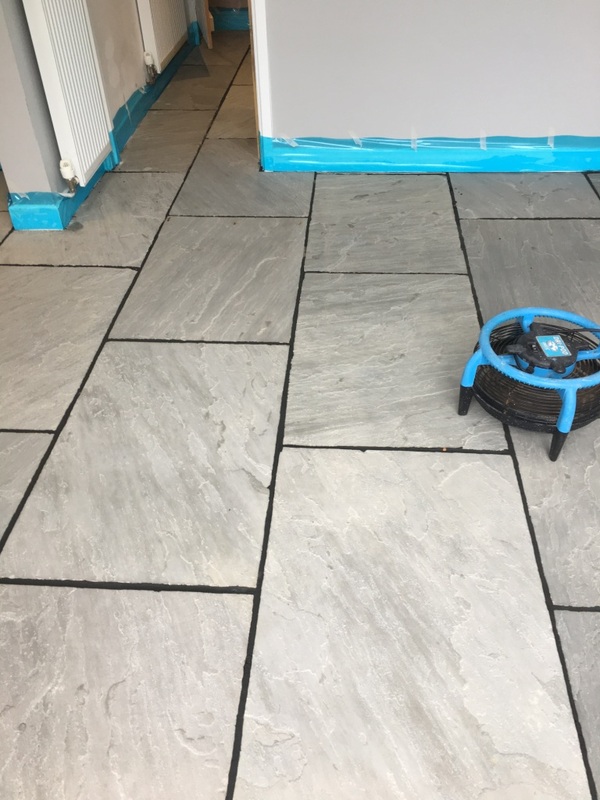 I did so by applying an initial coat of Tile Doctor Colour Grow sealer, which is designed enhanced the depth of colours. 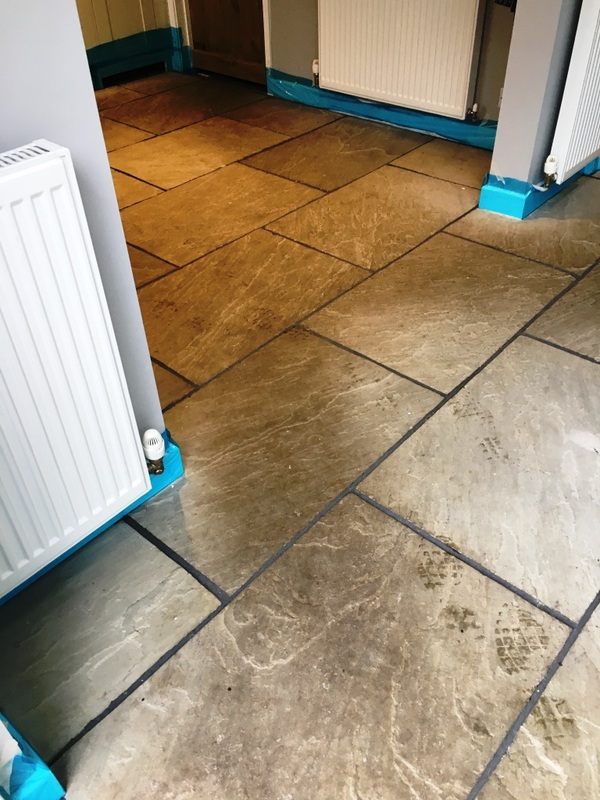 Colour Grow soaks into the pores of the stone to prevent dirt from becoming trapped within, making it particularly suitable for use on other types of porous stone, such as Limestone. As the stones were particularly riven, I carefully filled in the gaps with a paint brush, thus ensuring that the sealer covered the entire surface area. After the first coat had dried, I applied another. An hour later this too was dry and the site manager appeared, quite evidently pleased with the results. 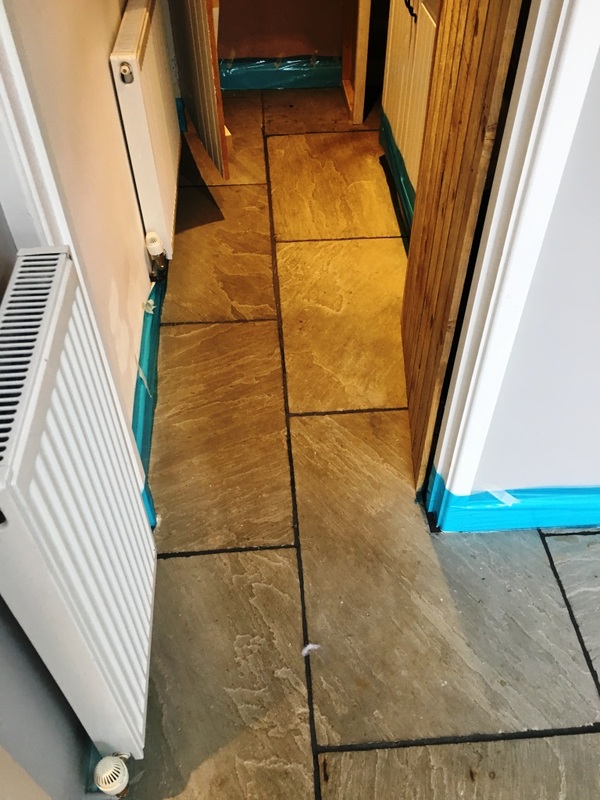 He commented that it looked amazing and he couldn’t believe the colour range on show, especially since they had the tiles had been hidden for so longer under thick layers of muck. 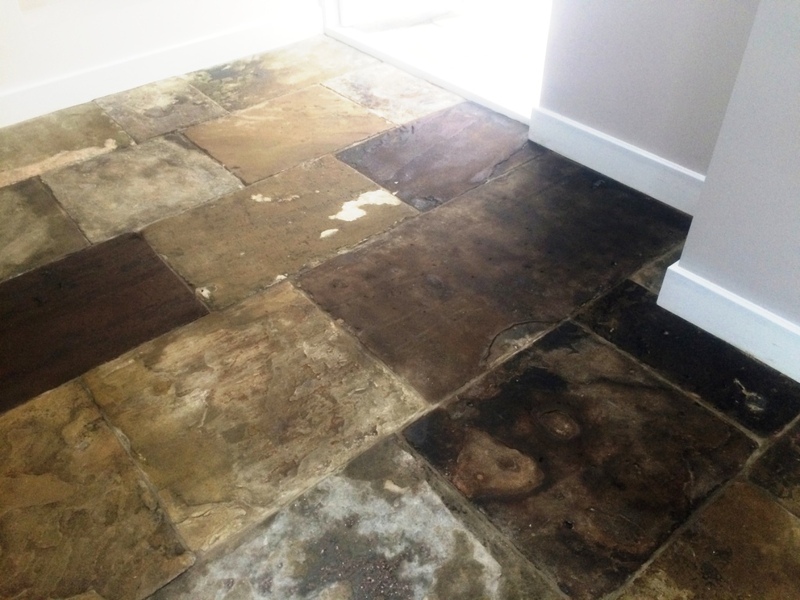 Thankfully, this is no longer the case, and this floor is ready to be enjoyed by the new homeowner.